Industry-leading insurance firm leverages Financial Transmission Network’s (FTNI) ETran receivables platform to tackle credit card payments and meet substantial security requirements. Credit Card Payments Go Off the Charts! 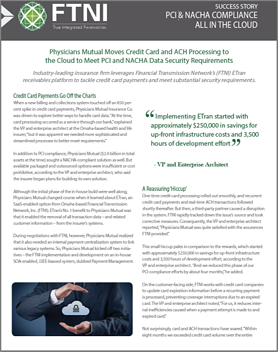 In addition to PCI compliance, Physicians Mutual sought a NACHA-compliant solution as well. But available packaged and outsourced options were insufficient or cost prohibitive, according to the VP and enterprise architect, who said the insurer originally began plans for building its own solution before finding FTNI. On the customer-facing side, FTNI works with credit card companies to update card expiration information before a recurring payment is processed, preventing coverage interruptions due to an expired card. The VP and enterprise architect noted, “For us, it reduces internal inefficiencies caused when a payment attempt is made to and expired card." Growing business means growing transactions, and that means continually seeking new ways to streamline AR processes while integrating new, highly secure payment technology and processes along the way. For this nationally known insurance firm, FTNI is the long-term strategic partner that will help them be as efficient and effective as possible.